High Fidelity or hi-fi Audio is a quality standard which means that the playback sound or images is very faithful to the original, noise and distortion is minimum. The term High Fidelity is usually applied to all domestic audio system of reasonable quality, although some believe that it attempts to a higher criterion. In one effort to standardize the term was done in 1966 by German Deutsches Institut fÃ¼r Normung (DIN) standard DIN 45500. Requirements established minimum response measures of frequency, distortion, noise and other defects and achieved some recognition in audio magazines. When high fidelity playback is limited to mono, a realistic approach to what a listener would experience in a concert hall was limited. The researchers realized early that the ideal for a musical experience reproduced by an audio was through multiple channels of transmission way, but the technology was not available at that time. For example, it was discovered that a realistic representation of the separation of interpretation into an orchestra from an ideal listening position in the concert hall would require at least three speakers for the front channels. For playback of reverberation, at least two speakers behind or to the sides of the listener would be required. The stereo sound provided a partial solution to the problem of creating some resemblance of the illusion of performers playing in an orchestra, creating a phantom center channel when the listener sits exactly in the middle of the two front speakers. When the listener moves slightly to one side, however, this phantom channel disappears or is greatly reduced. An attempt to provide reproduction of the reverberation was tried in 1970 through quadraphonic sound but, again, the technology at that time was insufficient for the task. Consumers do not wanted to pay the extra cost in money. With the increased popularity of home theater, however, multi-channel playback systems became affordable, and consumers are prepared to tolerate six to eight channels of home theater equipment. Advances in sound processors to synthesize an approximation of a good concert hall can now provide a more realistic illusion of listening in a concert hall. During the 1920s the amplifier electronics, the microphones and the application of quantitative reproduction of sound principles were introduced. Much of this pioneering work was done at Bell Laboratories and marketed by Western Electric. In the late 1950s and early 1960s, the development of disk Westrex monosurco gave rise to the next wave of improvements in domestic audio. Colloquially, the term “stereo” displaced “high fidelity”. In the world of audiophile, however, high fidelity continued and continues the goal of accurate sound reproduction and the technological resources are available for this purpose. A very popular type of system to play music in the 1970s and later is the integrated music center, the successor of the old stereograms or radiograms. Although these systems were not technically designed as hi-fi equipment, some of these were able to reproduce sound with acceptable quality. Embedded systems or media containing one or more sources such as a CD player , a tuner or a cassette player , together with a preamplifier and a power amplifier in a box. Such products are generally despised by audiophiles, although some high-end manufacturers have integrated systems. 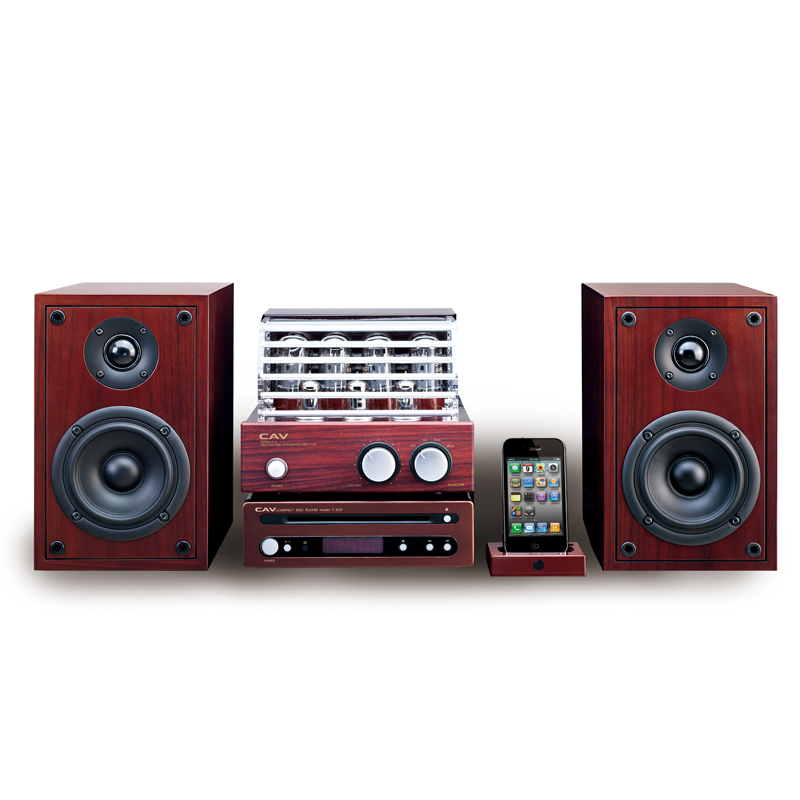 The traditional high fidelity enthusiast built a system with separate elements, often from different manufacturers specialized in a particular component. This provides maximum flexibility for changes in element and allows the audiophile create the illusion of creating synergies between elements or combine understands what is the specialty of each manufacturer. With somewhat less flexibility, a preamplifier and a power amplifier in a case is called integrated amplifier, a tuner, is a receptor. A mono amp is a monoblock power. Other modules of the system may include components such as cartridges, arms, turntables, DVD players that play a wide variety of discs including CD, CD recorders, recorders MiniDisc recorders, high-fidelity video ( VCR ), tape recorders, equalizers , processors signal and subwoofers . This modularity allows the enthusiast to spend as much as wanted on a component that meets the specific needs even if it means buying a larger number of elements such as power supplies, chassis, elements of the electronic interface between computers, etc. In a system composed of separate elements, sometimes a component failure, however, allows the partial use of the rest of the system, which can also occur in integrated. A repair of an integrated, however, system means a complete lack of use of the system. Another advantage of modularity is the ability to spend the money on a few basic elements at first and then add the additional components. Because of all these advantages of the modular way to build a hi-fi system instead of buying an integrated system, audiophiles usually assemble their systems with separate components. Some of the most obvious disadvantages of this way are higher cost, complexity and space required for components. The modern hifi usually includes signal sources such as CD players and digital tuners (DAB), an amplifier and speakers. Some modern equipment can be digitally connected using fiber optic cable and TOSLINK ports and can have USB support and wireless fidelity ( Wi-Fi ). A modern component is having a quick acceptance is the music server consisting of one or more computer hard drives that keep music in the form of files such as MP3 . If the hi-fi system includes components like a DVD player , projector, or TV , then it is often called home theater. This Article Has Been Shared 4522 Times! Cite this article as: Abhishek Ghosh, "High Fidelity or hi-fi Audio Explained," in The Customize Windows, January 19, 2014, April 26, 2019, https://thecustomizewindows.com/2014/01/high-fidelity-or-hi-fi-audio-explained/.